If you’ve got pesky squirrels around your property that you can’t seem to keep away no matter how many times you chase them away with a broom, it may be time to try squirrel repellent. If you’re especially worried the squirrels may try to enter your home, these DIY squirrel repellents are worth a try. 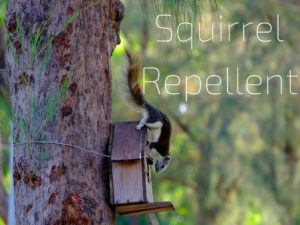 There are a few different kinds of repellents you can try based off of where you’re trying to keep squirrels out of. Spray Repellent- Bringing a mixture of cayenne pepper, onions, and jalapeno and putting it in a spray bottle is a great way to make a repellent that will keep squirrels away from specific areas around your home. Spray it near your porch or pool deck, or near your doors or garage. But be careful not to get it in your eyes! Spices Repellent- If you want squirrels to stay out of your garden, yard, or bird feed, just mix paprika, cayenne pepper, and red pepper flakes together and add them to your bird seeds or around your garden. The mix will be too spicy for the squirrels, but your birds will enjoy the extra flavor added to their seeds. Soil Repellent- If squirrels are especially a nuisance in your garden, digging up roots or burying nuts, you can mix laundry detergent and cayenne pepper into the soil. Remember that these suggestions are only temporary solutions to your squirrel problem. If there are particularly pesky squirrels with determination, these spices may not deter them from entering your home. When the repellent stops working, your best option is to call in your local squirrel experts at Critter Control® Tampa. We’ve got the tools and the knowledge to quickly and safely remove the squirrels from your property and your home, and relocate them to a much more suitable environment. If you’re tired of dealing with squirrels around your home, call us today for your free consultation at 813.948.0870.